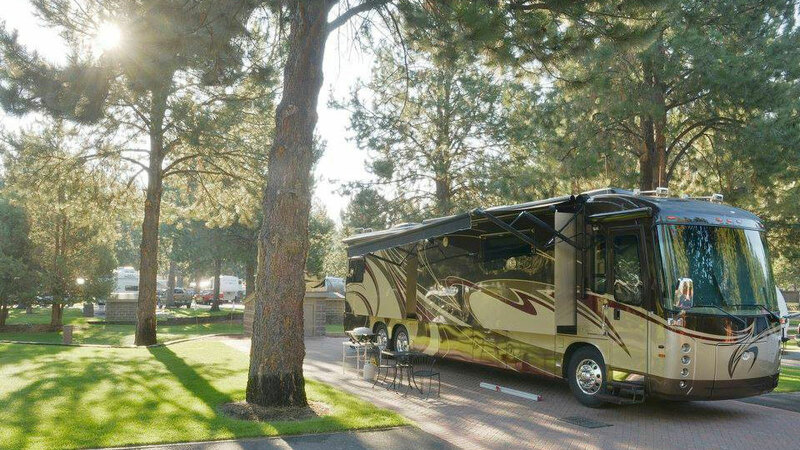 With paved streets, off-street paved parking, and 25 acres of manicured lawns with mature pine trees, the Crown Villa RV Resort sits in a quiet park-like setting on the southern end of Bend. Built for the discriminating RVer, they feature some 23′ x 72′ level sites that are big rig friendly. Each site pad is made of decorative paver bricks with individual brick storage buildings and around 1500 square feet of grass with shade trees. Over one hundred paved brick and seven gravel sites come with full hook-ups with 50/30 amp service, water, sewer, seventy-five channels of cable TV and free wi-fi. There are also ten partial hook-up sites with water and electric only. Other amenities include a clubhouse, jacuzzi spa, steam rooms, fitness center, guest lounges, state-of-the-art laundry facilities, restrooms with showers, business center, tennis/pickle ball court, off-leash dog park, bistro patio sets, complimentary newspapers, concierge service, RV parts, and more.